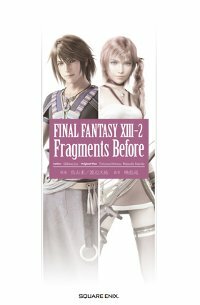 Fragments Before is a collection of short stories set in the world of Final Fantasy XIII and XIII-2. It's set between Episode i and FF13-2, and semi-continued in Fragments After, and was written by Jun Eishima. It was released on December 15th, 2011, and its ISBN is 978-4-7575-3466-7. The chapter starts from the ending of Final Fantasy XIII, as Vanille and Fang watch out to the world from within their pillar and compare it to a miracle. Everyone is saved. They follow the events as soldiers evacuating citizens of Cocoon arrive on the ground, and as Lightning, Sazh, Hope, Snow, Serah and Dajh enjoy their reunions. Serah and Snow talk about building a new home for themselves on Pulse and Lightning agrees. Hope finds a soldier who's seen his father, and relieved with the good news offers to help the soldiers in their rescue efforts however he can. Sazh offers to help with piloting airships and takes Dajh with him. Within the crystal pillar, Vanille and Fang feel the presence of the goddess, and realize who's behind this seemingly miraculous event. Down below, Lightning decides that it must be up to her to find a way to save the two from their sleep, judging that Snow and Serah will be too busy with their own project and deserve happiness, Hope is too young and Sazh too busy taking care of Dajh. Suddenly, she feels something, a strange power drawing her somewhere. As Serah and Snow discuss building their new home and a school for the town's children, Serah suddenly notices that Lightning is gone. And in a faraway place where the skies have no color, Lightning wakes up. A person is walking in a world he suddenly realizes is bigger than he thought. He remembers that his grandmother had told him how she'd seen mountains reaching to the skies when she was young, and as she was getting older she found herself with the desire to see the sea, even though it and the air around it could kill her. He remembers how his grandmother was the oldest person alive, and how it was considered a miracle in itself. His parents had passed away long ago, like most people did. The reason his grandmother taught him as well, that it was because Cocoon and the crystal sand from it fell and constant wars between people polluted everything, killing plants, animals and people, poisoning the waters and the land and the air. The remaining tribes had had to move many times, all the while losing numbers. As he was young only several other children accompanied him in his lessons, but in his grandmother's times there were dozens. During the lessons, he remembers himself and the other children wondering how stupid people of the past could have been, making war when they should have preserved the land and themselves, how stupid to have lived in a big city right below Cocoon, and how stupid not to have thought to stop it from falling. He also remembers his grandmother finally dying, leaving him alone. He's now traveled for so many days he's lost count, away from the village of his birth. He comes across the ruins of a human settlement he thinks might have been the village his father was born in, before they had to move. He moves on, unable to do anything else and unwilling to give up. He remembers as he marvelled at how in times past, people didn't die when they got sick. As a child he wanted to live in the times of the daughters of the goddess, before Cocoon fell, because that was a time when there were helpful people around. He thinks how important it is to remember the history of humanity, as if they forget there will be none left who remember, and the places die in truth. He walks through the grey-white desert towards the mountains, hoping to find humanity. He remembers as things in his home village got tougher as people died, and talking about this became a kind of a greeting among them. He also remembers how for the longest time he was the youngest child in the village, and how the girl younger than him was born. He remembers as the adults talked about this girl, saying that it was a blessing that she would be born even in an age like this, and how every companion of his who died asked that he would take care of the girl. He thinks how he would save her, by going back in time and telling people to not make war, to leave the dangerous underside of Cocoon, even go back to before the day of Ragnarok and prevent it, and how this would make a world where everyone could live. He struggles onwards and up the mountains, where quarry is very scarce and mostly winged. Higher up on the mountain he finds a spring and drinks his fill but gets sick. He lacks food and has horrible headaches, dizziness and weakness but carries on in his search. From high up, he finally sees the sea. It's dark and not at all beautiful, and he still cannot see any signs of humans. Still, he decides to carry on, and forces his unresponsive body to move. The cliff crumbles beneath him. When he wakes up, many hours have passed. When he tries to move his left hand there is excruciating pain and then it feels nothing. Smaller wounds are all over his body. He struggles up but cannot walk, and falls again. He wonders why they were born in an era like this when everyone must die. It is cold and he cannot move, but he does not give up his resolve to find a way to a better future. Suddenly something shines in the skies. He realizes that the goddess has blessed him. Noel Kreiss is engulfed in the light.